Designer Diane von Fürstenberg will today present the Vital Voices leadership in public life award to Tep Vanny, a self-branded housewife who has become a guiding light in Cambodia’s battle against forced evictions. Carried out in the name of progress, forced evictions now rank as one of the world’s most serious human rights abuses. Amnesty International defines them as “when people are forced out of their homes and off their land against their will, with little notice or none at all, often with the threat or use of violence”. And in Cambodia, a country devastated by the pursuit of profit, it is housewives who have come out fighting against them. Western feminists should not lose sight of the fact that in many countries around the world, women’s role as wife and mother remains central to their family and societal status. When homes are threatened with destruction, it is women who are disproportionately affected. While women are commonly framed as defenceless “soft targets” in forced evictions, Vanny and her fellow housewives complicate this assumption. Harnessing softness as a strategy rather than a hindrance, these women have committed themselves to a sustained campaign of nonviolent protest. Worried that involving men would only encourage violence, “turning men into goldfish clashing with each other”, they are using their positions as wives and mothers to co-opt riot police through their songs of suffering and to morally shame them when they are publicly beaten. In contrast to British stereotypes of the inward-looking housewife, these women are committed and forward-thinking political activists. Their influence extends far beyond the homes they care for. Wearing a T-shirt emblazoned with the slogan “The Whole World is Watching”, one of the women explained that with guidance from NGOs, the group’s members have become experts at building a spectacle courted by the international media. Exposing their bare breasts outside the Cambodian parliament, they aimed to demonstrate the vulnerability of being left only with their bodies. And donning birds’ nests complete with chicks on their heads, they came out in defence of their role as mother hens. Not content with these national displays of resistance, the housewives took a lead role in submitting a complaint to the World Bank, insisting that it had breached its operational policies. The World Bank admitted that its land titling project had contributed to the harms suffered, and suspended its loans to Cambodia. The housewives of Boeung Kak are playing a critical leadership role in publicly contesting large-scale losses of homes that are being felt in communities sadly too numerous to name. In taking on this extra burden, housewives in Cambodia have become domestic goddesses battling global problems. So what does this mean for British women? 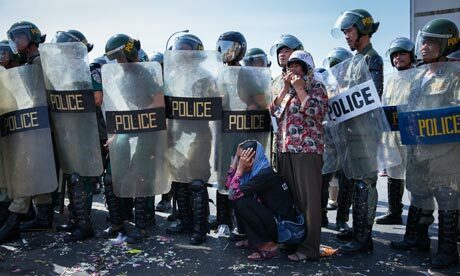 While forced evictions are rare in this country, the courage of the Boeung Kak women is not without precedent in the UK. We only need to think back to Greenham Common in the 1980s for an example of housewife activists who fought to protect their families against the feared instalment of nuclear weapons in southern England. Both sets of women, whether in Cambodia or Britain, show the power that housewives can wield, of illuminating injustices at the highest of political levels. Vanny and the women of Boeung Kak may not have won the geopolitical battle against forced evictions in Cambodia, but they have shown that housewives should not be slated, but rewarded, for their inspirational dedication to domestic life.